Happy Fall! Have a Ball! Hi, it’s Julie, from redheadcandecorate.com! You know, as a little girl growing up in New York State, Fall was all about Halloween. I remember tons of curled leaves on the sidewalks as I scooted through the neighborhood in my cat costume collecting candy in my pillowcase. I’m not even sure if I noticed the colorful foliage before the leaves shed, but I do remember having a plan to rake the entire yard by myself. I remember raking so long that blisters developed on my little hands, and my dreams of mile high piles to jump in quickly turned to thoughts of, “Maybe I should go watch the Brady Bunch and try again later” thoughts. Ah well…at least I went after my dream and had fun even when it didn’t turn out the way I expected. That’s my hope for all of us this Fall. To have some good ole fashioned fun. Before you know it, the snow will be flying so there is no time to waste. 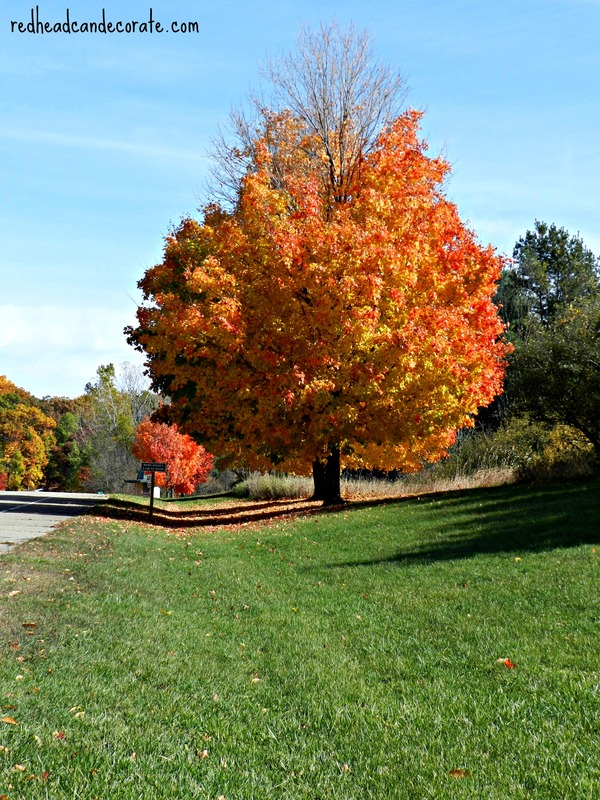 Here is my list of favorite fun things to do this Autumn season that don’t require a lot of money, or a lot of effort. 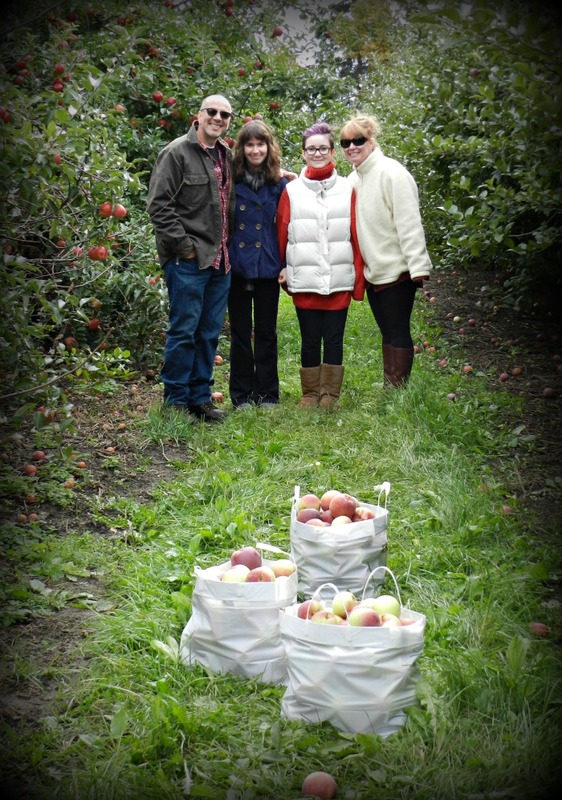 Every year, right around the end of September we head out to our local apple orchards. Last year was a hoot because it was quite chili. We acted like crazy apple thieves running in there for our “pecks” of apples. We did it in record time because of the temps. Hopefully, this year it will be warmer and slower. We enjoy Empire apples the best…they are crisp, sour, and sweet all at once. Granny Smith make the best pies though. What are your favorite apples? 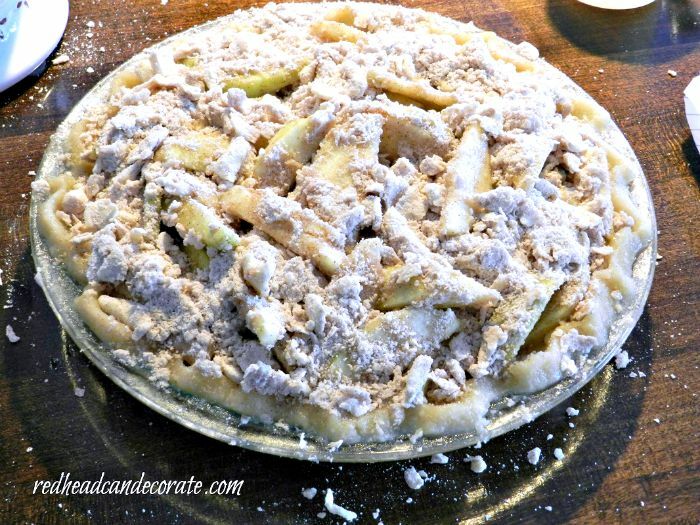 I think my husband wanted to marry me all over again when I began to bake my own apple pies about 10 years ago. There is nothing like the smell of fresh sweet tangy apples baking with the sugar and spices. I think I may have to make one this weekend after seeing this photo. The young folks like to bake too, so this would be a great time to encourage them to help. 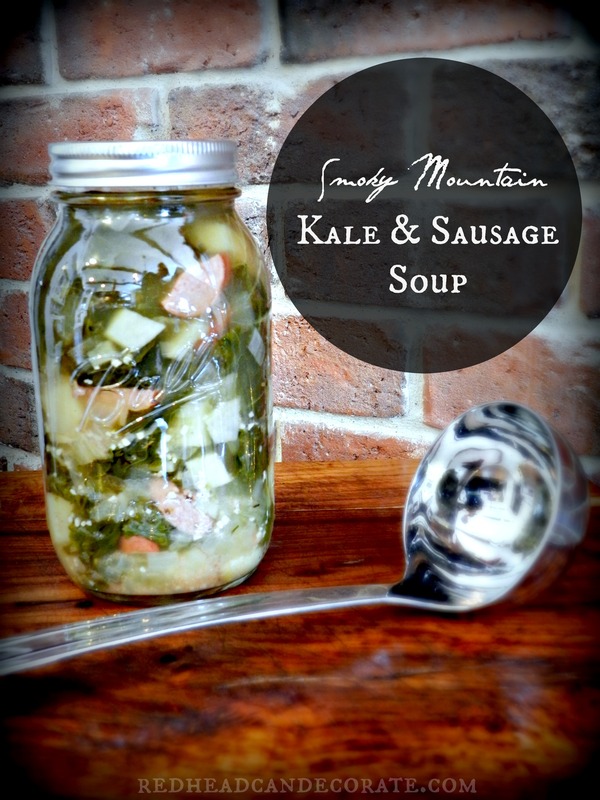 Heat up your favorite soup and pack the pot up in a few towels and a cooler. Coolers can keep things hot too! 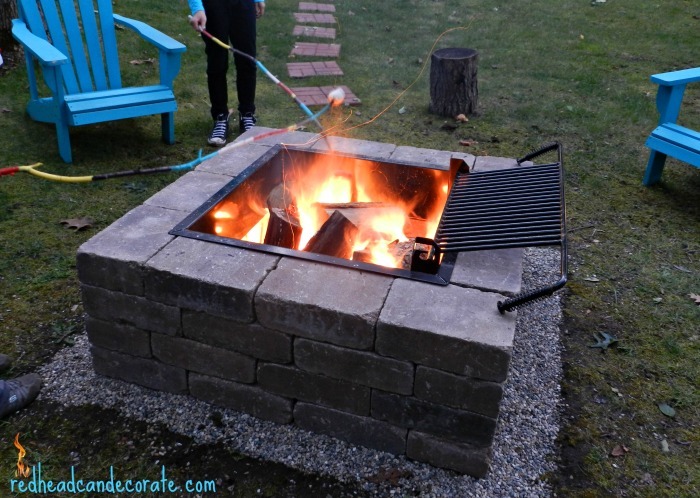 Or light a grill at a park with coals and put the pot there to heat it up. All you would need is some large coffee mugs to serve it in, a loaf of crusty Italian bread to break apart, and something cold to drink. Don’t forget the blanket and pillow. Wait, if you do this before the Soup Picnic, you would have a blanket to sit on. 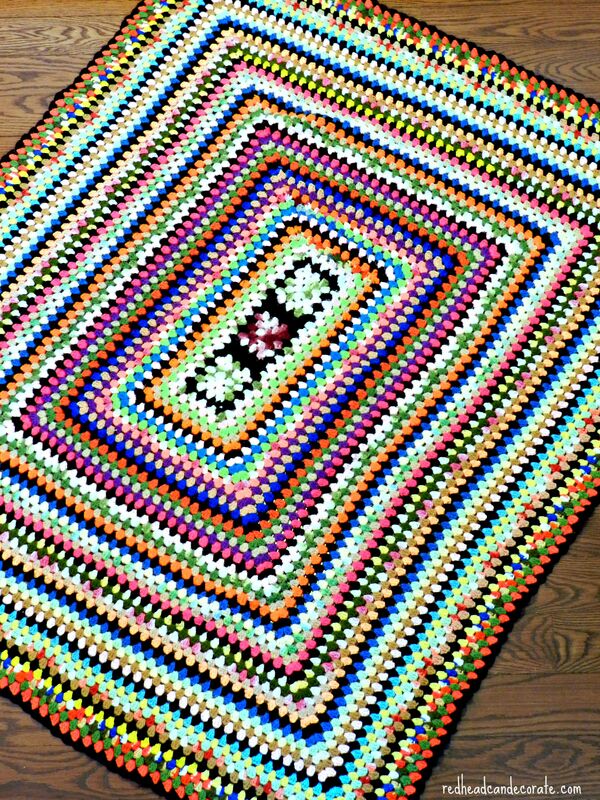 Can you believe I found this beautiful crochet blanket at Goodwill? Such gorgeous colors and perfect for those Fall naps. If you find one, just wash it in hot water a couple times because you never know. With what? Yes…I am obsessed with scarves, flannels, and boots. So much so, that I am beginning to incorporate them into my home decor. I can’t keep buying things at stores because the house is getting too full. Time to use what I have, and hey…it looks and feels great. 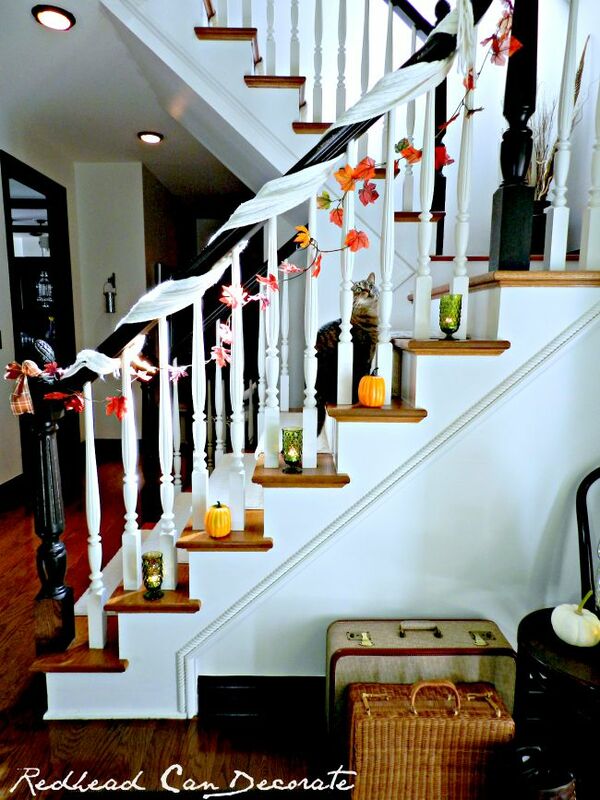 Just wrap your favorite scarf down your bannister, and secure with thumb tacks. The remaining supplies are mostly dollar store buys. The candles are thrift store glasses with t-lights. There is no doubt that gardening is relaxing and good for the soul. 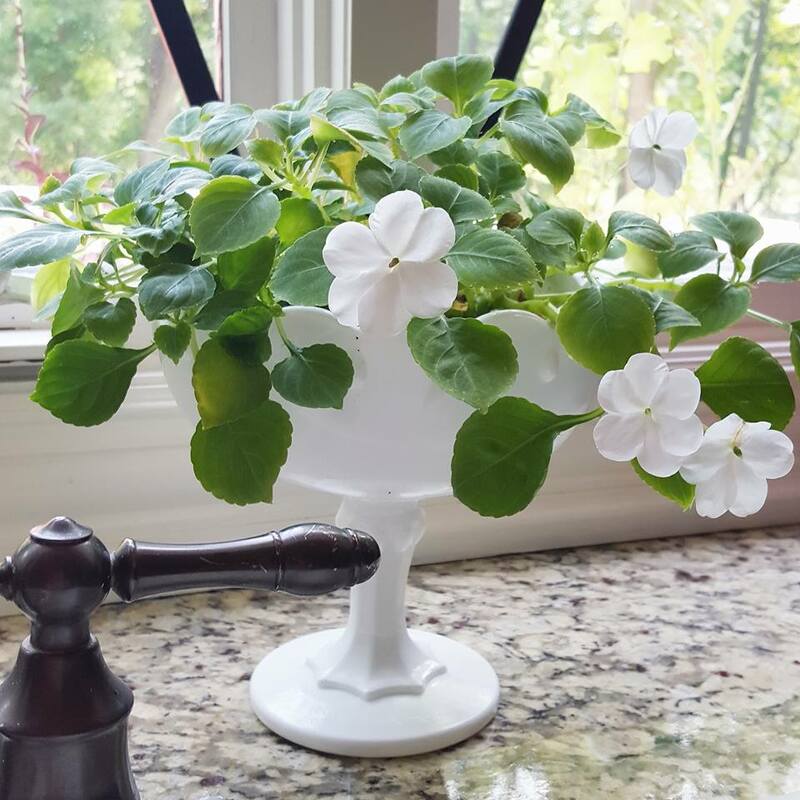 Did you know that Impatiens can survive indoors, too? You just need an indirect sun window like I have at my kitchen sink. They need to be kept moist, too. I just grab my dish sprayer and spray them once a day when I’m doing the dishes. We have campfires all Summer long, but it might be too hot for some of you. We also have to be careful of the dry regions. Be sure to call your local fire company to check if conditions are appropriate to enjoy a fire with the kiddos, or your neighbors. If you don’t have a fire pit, light some candles and relax. Don’t forget the S’mores Dip. Full recipes and tutorials can be found on redheadcandecorate.com. Follow Redhead Can Decorate on Instagram here. Subscribe to Redhead Can Decorate here. 11 Comments on "Happy Fall! Have a Ball!" Where in NE Florida did you live. I live on Amelia Island and do miss the Fall color you get – just have to make a trip to the N. Georgia or NC. We lived in Jacksonville, Debi. Small world!! Fall was my favorite season down there. It lasted for months where here it is very fleeting. When can I come over, Julie?! This post SO puts me in the mood for fall!!! Just beautiful! Great blog to feature At The Picket Fence!!! Thank you, Heather! You are welcome any time sister. Wouldn’t that be FUN!! I thought it was funny how you spelled “chilly” as chili! Not sure you meant to do that, but I associate heat with chili. Homemade apple pie is a sure fire path to a mans heart! Did I really? LOL. I must have been craving chili! If not, now I am. Thanks for the heads up, Rose! We are getting just a touch of fall here in Atlanta. I’m still wearing sandals – not quite ready to trade them in for boots! We are lucky here, because it is just over 2 hours to the mountains of Western North Carolina, where you can see spectacular leaves in the fall. We love to go to the N. Ga mountains to apple pick. I was just talking with my youngest son today about going apple picking this weekend! Fall is my favorite season! Great pictures! The one with scarves decoration is something I simply have to do in my house immediately!